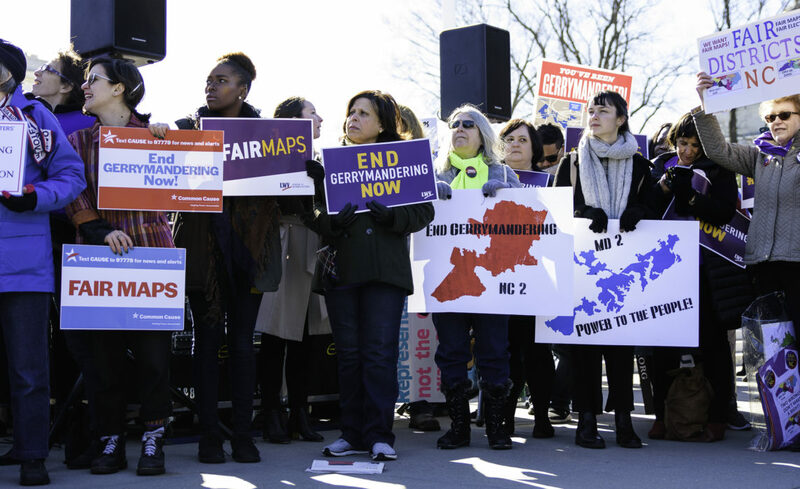 On March 26, the U.S. Supreme Court heard arguments in two landmark redistricting cases that could fundamentally change the future of American democracy. In our case Rucho v. Common Cause, we argued that North Carolina Republicans violated the Constitutional rights of Democrats through an extreme partisan gerrymander that gave the GOP a 10-3 advantage in House seats despite earning just over half of the votes. In Lamone v. Benisek, which was originated by a Common Cause member, plaintiffs argued that Maryland Democrats violated the First Amendment rights of Republicans when they redrew a congressional district to flip it from Red to Blue. Every Justice on the Court, conservative and liberal alike, started from the place that partisan gerrymandering is a problem. Chief Justice John G. Roberts and Justice Brett Kavanaugh both asked intellectually curious questions that demonstrated their interest in discussing what a solution could look like. Justice Kavanaugh: I took some of your argument in the briefs and the amicus briefs to be that extreme partisan gerrymandering is a real problem for our democracy – and I’m not going to dispute that – and that the Court, even though it might be a problem to get involved in all these cases, should, in essence, recognize the emergency situation from your perspective. This was especially evident in the Maryland case, where Democrats drew the congressional districts to increase their advantage to seven to one, instead of the six to two advantage they had historically held, and where these Justices call home. Justice Kavanaugh: That – the stated goal was seven/one. Justice Kavanaugh: The governor and others. Justice Kagan: Well, for some, the governor, the speaker. Justice Kavanaugh: I mean, I don’t think you should run away from the obvious. I mean, the crossing the bay thing is not very persuasive, given all the evidence that this was just seven/one. While there were questions about whether partisan gerrymandering was “self-healing” i.e., it could be remedied through ballot initiatives or state legislative reforms, the Justices know that 31 states are unlikely to reform redistricting on their own — because voters in those states do not have access to ballot initiatives. Maryland is among the states without ballot access, and the legislature has failed three consecutive years to pass reforms. 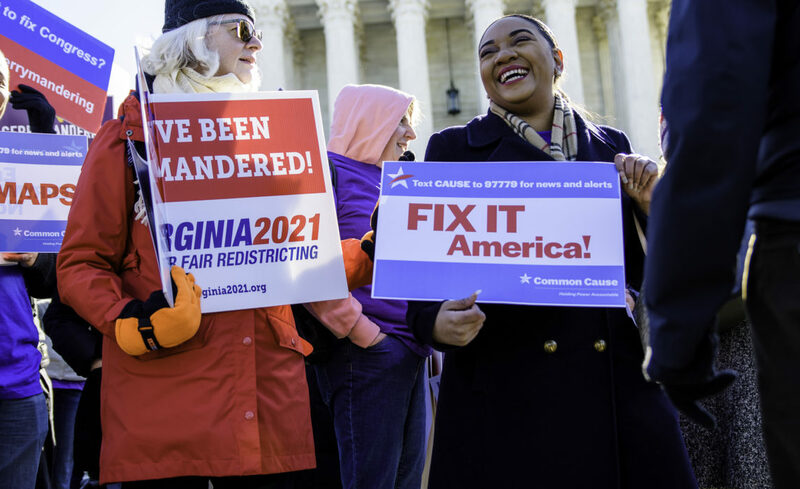 And regardless of the party in control of the state legislature, North Carolina over the past 30 years, and with dozens of bills filed, has failed to pass any redistricting reforms. The Justices focused the argument on the merits of the case and asked questions about practical standards courts could use to evaluate claims. This indicates that they do not want to punt on gerrymandering again (remember last year’s Wisconsin disappointment?). The Justices are considering a solution, the theoretical underpinnings in the Constitution and the timing. A decision should come before the 2020 Census, which informs the maps for the next decade. Interestingly, Justice Kavanaugh repeatedly asked each speaker to talk about the possibility of using proportional representation as a standard. Where other conservative justices seemed ready to dismiss this possibility, Justice Kavanaugh seemed sincerely interested in this as an intellectual starting point. Chief Justice Roberts: I guess I don’t understand. I mean, if you have, I don’t know, any other kind of state employee and you don’t like her exercise of First Amendment Rights, and you fire her, there’s pretty well-established analysis for approaching that case. And I don’t understand why the same wouldn’t apply here. Chief Justice Roberts and Justice Kavanaugh have a personal interest in emphasizing the court is nonpartisan, and these partisan gerrymandering cases are a real chance for them to send that message to the American public. Time and time again, political insiders and media talking heads have pronounced that redistricting reform is impossible. It’s easy to fall into a cynical frame when it feels like all the levers of power are controlled by naysayers who sow the seeds of doubt about the complexity of citizen-led commissions or the quagmire of constitutional measures. History has shown us that fundamental political change is possible — from the American Revolution to the establishment of the One Person, One Vote principle — when we nurture the belief that a more perfect union is worth striving for.